• Sarah is in immediate danger and must be protected. • There is not enough time to explain the nature of the danger and persuade Sarah to flee with Frank. • Sarah and Frank are not, at this time, close and Sarah has no reason to take Frank's word for it that she is in danger without a time-consuming bout of persuasion. • Therefore, according to Frank, the correct course of action is to take Sarah to safety immediately, without her consent, and attempt to prove later that he was acting rightly. • Given that he has not acquired Sarah's consent, he needs to expect that she will resist and so he needs to confine her until the rescue is complete. • There is a risk that Frank may completely lose Sarah's affection by this violation of her freedom, but saving her life is worth that loss. Frank's analysis is borne out, by the movie, to be correct; he is able to demonstrate to Sarah that she was in danger and she forgives his violation of her consent. As a bonus, her affection for him becomes stronger - not strictly out of gratitude for the life-saving thing but because she gets a chance to admire Frank's awesome immortal powers. In Eclipse, Edward arranges a kidnapping of Bella when he feels that Bella is in danger from Bella's werewolf friends. Compare Edward's analysis of the situation to Frank's above. Spot the differences? • Bella has spent a great deal of time with werewolves and has demonstrated that there is no imminent risk to her of harm from werewolves. • There is adequate time to persuade Bella that she should not put herself in danger by hanging out with werewolves. The attempt to persuade has been made by Edward and Bella is not persuaded. She does not agree that she should stay away from werewolves. • Since the attempt to acquire consent has failed, and even though the risk has been proved to be low, Edward (with Alice as accomplice) proceeds to override Bella's agency by confining her in order to prevent a meeting with her friends. • Edward has already confined Bella once before (by disabling her truck engine) and she did not withdraw her affection at that time, so the risk of losing Bella's affection by this course of action is low. Most of Edward's analysis is shown by the books to be incorrect – Bella is never at any real risk from the werewolves, and Edward's kidnapping scheme fails to keep her away from them in any case. However, his actions are validated when Bella completely forgives his violation of her freedom, because it was motivated by True Love and that is justification enough. In the eyes of both Bella and Sarah, life as an immortal killing machine is pretty cool. Both women would like to join their mates as immortals at some point in the future. Even though they are not yet immortal, they still want to hang out with the immortal family and contribute as best they can to the activities, well-being and safety of the family. In spite of the desire each woman has to be an active and helpful participant, both Edward and Frank are very afraid that harm will come to their love. Edward's family, and Alice in particular, actively support Edward every time he does anything to remove Bella from the path of harm. To the family, his need to be free from fear outweighs anything Bella may want or need. Marvin, who is otherwise an Alice analogue, is having none of that. In RED 2, Frank may want Sarah to be protected in a safe house, but Marvin knows that Sarah should be given her chance to be part of the team. He fetches her from the safe house, drives her to the centre of action and gives her a gun. The rest of the family greet her enthusiastically and treat her as though this is where she belongs. And Sarah does belong. She has skills that none of the immortals have. By using her skills in RED 2 she is able to: get necessary information out of someone who would not otherwise provide that information even under threat of torture, protect their escape route out of the Kremlin, and infiltrate the Iranian embassy. In Twilight, Bella does not fare so well. Whenever she tries to use her own initiative and her human skills to help the family, she fails. She tries to save the family and her mother from James, but she gets it wrong and ends up drawing the family into the confrontation she wanted to avoid. She tries to help Edward and Seth in their fight with Victoria by providing a distraction, but all she does is mess up Edward and Seth's perfect strategy. Even the one time she is able to be helpful, by saving Edward from the Volturi at the end of New Moon, she is following Alice's instructions exactly and showing no initiative of her own. And even that is just a partial success; she does not actually save Edward at that point, she just delays Edward's fate until later when someone else can do the actual saving. 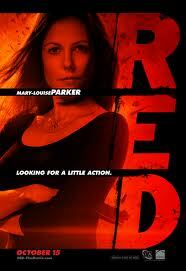 I'm not arguing that RED 2 is a paragon of feminist thought. For example: that skill Sarah has that she uses to achieve all those essential achievements? It's her ability to make people like her. Can you find a ‘girlier’ skill for her to have?